The steps that you should take following an auto accident are an important aspect of maximizing the compensation that you receive for losses and damages. 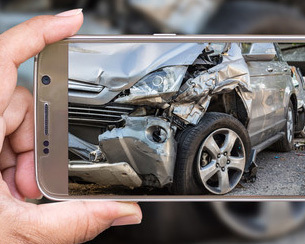 At Carluzzo Rochkind & Smith, P.C., we lay out the appropriate steps that will aid you immediately after the wreck and during the legal process. If you have just been involved in a car accident in Manassas, Prince William, Manassas Park, Gainesville, Haymarket, Woodbridge, Lake Ridge, Dumfries, Bristow, Warrenton, Centreville, Fairfax, Stafford, Chantilly, Leesburg, Ashburn, Sterling, Herndon, Reston, Alexandria, Annandale, or Arlington, please call our law firm right away. We help people throughout Northern Virginia and the Washington, D.C., area set their cases up for success. Contact law enforcement to complete a report of the accident and attend to all possible injuries at the scene. Tell the police officer that you aren’t hurt. Exchange insurance and contact information with other drivers in the accident. Panic if the other driver doesn’t have insurance. Seek medical attention from EMTs and paramedics at the scene. You don’t have to leave in the ambulance if you don’t want to. Refuse medical attention from EMTs or paramedics. Take pictures of your injuries and document how you feel and how your life is restricted by your injuries. Get your car repaired until after the condition of it following the accident has been documented completely. Contact an experienced personal injury lawyer immediately. We will get straight to work investigating the accident scene and handling all legal aspects of your case. Speak with your insurance company before speaking with a lawyer. Even your own insurer will not work in your best interests, instead minimizing and devaluing your case. Our team has years of experience in negotiations with insurance companies and at trial. Learn more about the representation our lawyers offer by scheduling your free initial consultation. We can be reached online or by calling 703-361-0776. Northern Virginia, including Manassas, Prince William, Manassas Park, Gainesville, Haymarket, Woodbridge, Lake Ridge, Dumfries, Bristow, Warrenton, Centreville, Fairfax, Stafford, Chantilly, Leesburg, Ashburn, Sterling, Herndon, Reston, Alexandria, Annandale, and Arlington. Please Tell Us About Your Case. We’ll Respond Promptly. Carluzzo Rochkind & Smith, P.C. Serving clients throughout Northern Virginia, including Manassas, Prince William, Manassas Park, Gainesville, Haymarket, Woodbridge, Lake Ridge, Dumfries, Bristow, Warrenton, Centreville, Fairfax, Stafford, Chantilly, Leesburg, Ashburn, Sterling, Herndon, Reston, Alexandria, Annandale, and Arlington.